Chances are you’ve been hearing about probiotics for years now – both as supplements and in prepared foods. Recently, pre and probiotic supplements became the United States’ third highest selling healthcare product behind vitamins and minerals. So what exactly are these amazing microorganisms, and what are the health benefits they may deliver? A probiotic is, by the World Health Organization’s definition, a living microorganism that “when administered in adequate amounts, confer a health benefit on the host.” And although the research that’s shown the health benefits of these microbes is fairly recent, probiotics themselves are nothing new. The fermentation processes that preserve dairy and other foods (fermented and cultured foods are the perfect environment for probiotics to flourish) are ancient, and even the Greeks and Romans recognized their health benefits. Many of our Southern grandparents recommended cooking with (and even drinking!) buttermilk, one of the more common American sources of probiotic cultures. Science tells us that keeping our intestinal tract healthy can have wide-ranging benefits. 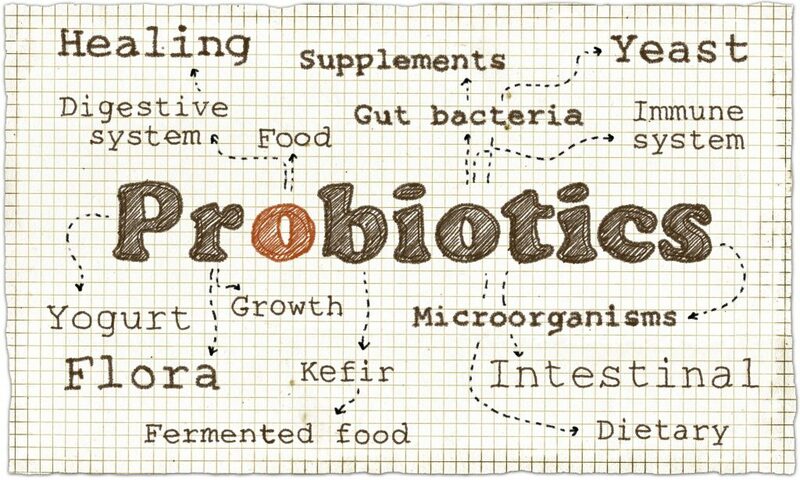 It’s thought that probiotic organisms help to keep the millions of bacteria naturally occurring in the human gut well-balanced and able to naturally boost the immune system, helping the body to fight infection and illness. Some of the most promising effects of a healthy gut include alleviating symptoms of digestive tract maladies such as Irritable Bowel Syndrome and ulcerative colitis. Probiotics can also be helpful after a course of antibiotics, as these drugs will kill both harmful and beneficial bacteria in the gut. Probiotic treatments can re-establish a healthy balance of “good flora” and lessen antibiotic symptoms such as diarrhea or cramping. Here in the U.S., yogurt, buttermilk, and fermented soy products such as miso and tempeh are the most easily available sources of dietary probiotics. If you’re talking a probiotic supplement, be sure the label guarantees live delivery of cultures for maximum potency. Adding probiotics to your well-balanced diet is a great way to naturally boost a healthy immune system!